DIY Hanging Clouds Raindrop Heart Decorations for Baby Shower Party Decorations, Baby Nursery Decor, Baby Room Kids Bedroom Wall Window Ceiling Hanging Decorations. 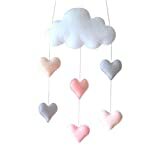 Lovely cloud and love heart design with beautiful color. Hanging it from either a wall hook, door handle or light fixture. A perfect gift for baby or nursery. Make your home decoration more cute and dreaming.